The main thing is a Grade 1 that gets a lot of Power if you spam the field. CONT (RC) Generation Break 1: If you have a “Musketeer” Vanguard, this Unit gains Power+1000 for each of your other “Musketeer” Units. For Today’s Card, from the Extra Booster “The AWAKENING ZOO” (on sale Friday December 8th, 2017): 2 《Neo Nectar》 cards, one of which is “Lantana Musketeer, Rezeeta” (which has a Stride Bonus) and the Grade 1 Support Card, “Black Rose Musketeer, Vernelli”. “Lantana Musketeer, Rezeeta” is a “Musketeer” with a Stride Bonus! When you Stride with a “Musketeer” G Unit, you can look at the top 4 cards of your Deck to call a “Musketeer” among them! You can increase your Rear-guards without paying a Cost. Also, upon achieving Generation Break 1, you can make the Stride Cost of “Musketeer” G Units “Counter Blast 1 and return 2 “Musketeer” Normal Units from your Drop Zone to the bottom of your Deck in any order”! By using this Skill, you can Stride without using your hand! It’s a card you can depend on when you have a smaller hand than usual and you want to hold onto your hand. 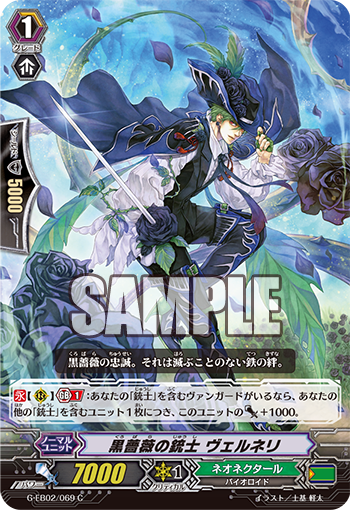 Also, “Black Rose Musketeer, Vernelli”, if you have a “Musketeer” Vanguard, for each of your other ally “Musketeer” Units, this card gains Power+1000! From here, if you have 5 other “Musketeer”s, this card will gain 5000 Power, meaning its base Power will be 13000 (sic: 12000) for Attacks and Boosts. These two cards strengthen “Musketeer” Decks!